Kalanithi’s book When Breath Becomes Air quickly topped the New York Times best-seller list for nonfiction when it debuted in 2016, and spent 13 weeks on that list. It has sold a million copies and has been translated into 34 languages, including Mongolian. 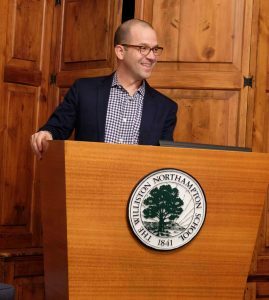 Ward has edited many books in his seven years at Random House, where he’s editor-in-chief of nonfiction, and he found that while Kalanithi’s memoir had great literary merit, its editing presented unique challenges. For one, Kalanithi died suddenly and unexpectedly three months after providing Ward with a first draft. Aside from the considerable grief this caused, there was the logistical puzzle of what to take from Kalanithi’s writings and how to put them together in a way that would be true to the author’s voice and intent. Ward met with Kalanithi’s widow Lucy, and pored over the doctor’s writing, at first paralyzed by the responsibility. After moving past that initial block, however, Ward was able to follow the “map” left by Kalanithi toward a work of nonfiction about which New York Times critic Janet Maslin said, “I guarantee that finishing this book and then forgetting about it is simply not an option.” This praise helped topple the final potential difficulty: marketing the book without the benefit of its author. The reading public flocked to Kalanithi’s simple and moving prose.